This looks interesting and many people have speculated as to what it does. 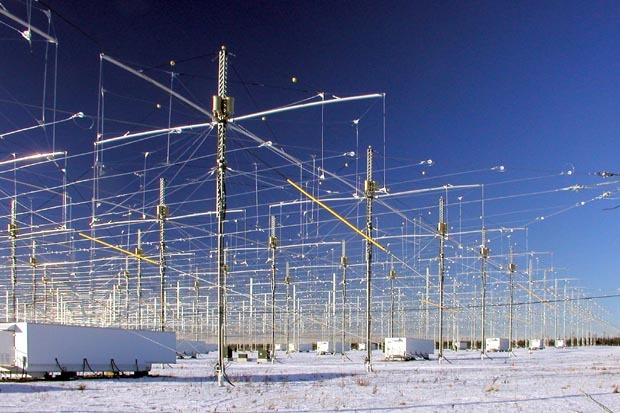 The High Frequency Active Auroral Research Program, AKA HAARP in the parlance of the acronym heavy US military, is designed to do Ionospheric research. That array is described as 180 crossed dipoles in a rectangular planar array. Transmitter power output is reported as 3.6 MW with an ERP of 5.1 GW in the frequency range of 2.6-10 MHz. That’s a whole bunch of watts. The array was built around 2004 and operates intermittently at various powers and frequencies. A view of the individual antennas. They look like broadbanded fan dipoles arranged in cross configuration. Depending on how they are phased, the gain of this system would be a factor of 10 or slightly more. All photos courtesy of HAARP. 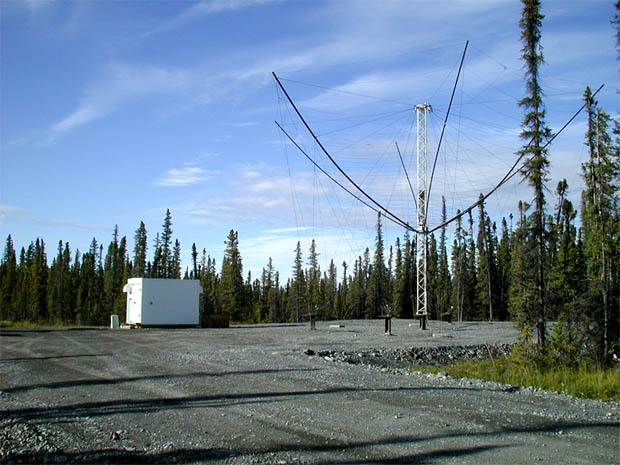 The main focus of this system is to study the Ionosphere, which is a critical part of wireless communications. In the HF frequency range, (and to some extent MF) signals bounce off of the Ionosphere (so called “skip”) and can travel many thousands of miles on relatively low transmitter powers. All satellite based communications pass through the Ionosphere on the way to and back from the satellite, as does GPS. Back in 1990, when the US Navy and Air Force proposed the project, HF radio was a key part of their communications network. Since then, mostly satellite modes have taken over that role, but HF is still relied on heavily. Further, studying the cause and effects of such things as Aurora Borealis, the Van Allen belt, high altitude nuclear burst,VLF, ULF, and other communications phenomena is important not just to the military, but society as a whole. We rely heavily on the communications infrastructure for things like cellphones, broadband internet, telephone service, banking, credit card transactions, etc. It has been long known that disruptions in the ionosphere can impact all of those services. The problem with the Ionosphere is its location right on the edge of space. Too high for aircraft or weather balloons to reach, too low for satellites, it remains, for the most part, a mystery. The program was founded to research this area by beaming focused energy to small areas and observing the results from a number of different locations. And others. Naturally, none of these things ever happened before the array was constructed in 2004. In another wrinkle, TWA-800 crashed in 1996 off of Long Island, NY. In all fairness to the Conspiracy Theorist, USTPO number 4,686,605 (Eastlund/ATPI) does indeed mention weather modification as a theoretical possibility. While 5.1 GW may seem like a lot of power, I doubt very much that it could compete with the Sun’s output and change weather patterns in any perceptible way. Everything about this program is top secret, or rather T O P S E C R E T or above. Exactly how it accomplishes these things, no one can say. As with any T O P S E C R E T government program, ample access and pictures are available to the public from a variety of sources and annual open houses that are held. People generally fear what they don’t understand. In this respect, the government, through perhaps the sometimes security conscious military, has done itself no favors. 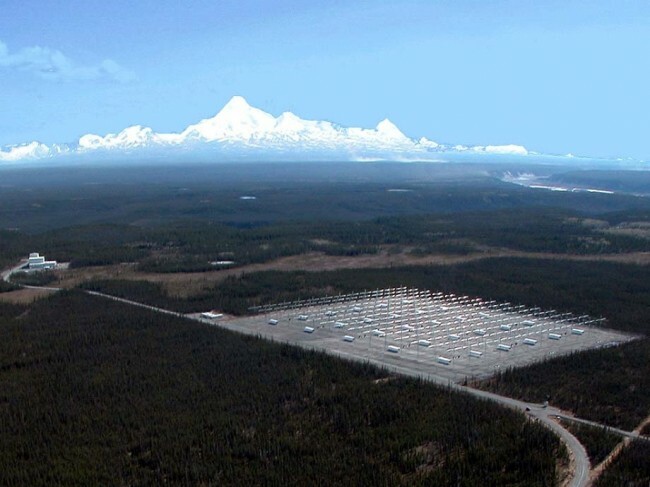 The reality is this: Taking into account free space loss, the distance (100 to 350 KM or 62 to 218 miles) and power levels reportedly being used, the power density is no more than 3 μW/cm2, as given by the HAARP website. My own calculations show: If the ERP is 97.1 dBW or 127.1 dBm, then the free space loss at 100 KM and 2.6 MHz is 80.7 dB, which would be the worst case scenario and might not be technically possible with those antennas (it would be much larger due to antenna inefficiencies at 2.6 MHz). However, with that configuration, the power density is 0.47 μW/cm2, far below the stated 3 μW/cm2. To put this into proportion, the Sun averages about 7.32 W/cm2 over the entire surface of the Earth. More near the equator, less near the poles. To compare the two; HAARP=3μW/cm2, the Sun=7,320,000μW/cm2. That is not good enough for some because HAARP is located far north, about 62° N latitude, so it gets less sun. Even so, the power from the Sun at 62° N is still many orders of magnitude greater than the HAARP array. There are plenty of things to be concerned about in this world, this is very low on the list. The conspiracy theorists should do a little more in depth research on their subject matter, it would lend a bit of credibility to their story.